Without the right equipment, making stickers can be a nightmare. You can run some cheap sticker paper through a regular printer, but you’re going to end up with some pretty weak stickers. They certainly won’t be nearly robust enough for outdoor applications, like bumper stickers. They’re going to have color issues. They’re not going to come out in shapes that you want, and if you cut them from a complete image, you’re probably going to waste gross amounts of ink. Selecting the right sticker maker isn’t all that challenging, though. 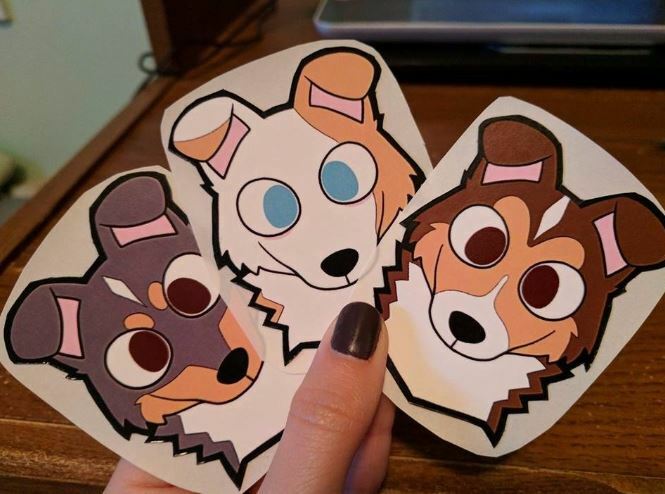 It just depends on knowing what kind of stickers you want to create, and having realistic expectations about what your sticker maker machine can do for you. Depending on your budget, you can find sticker maker machines that are as simple as pressing a button, or as complicated as programming a maneuverable blade. 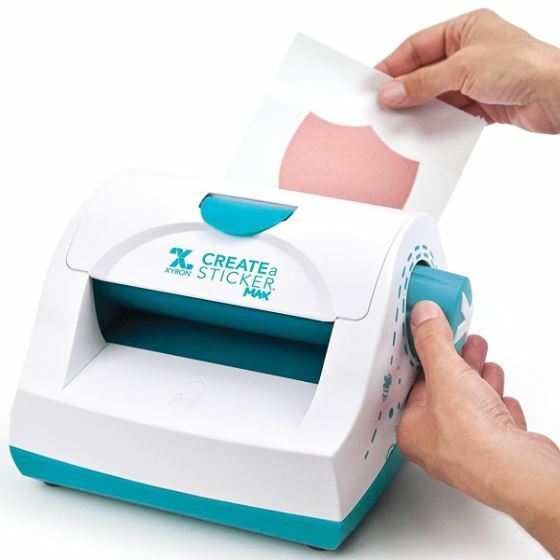 The simplest sticker machines are no more complicated than taking something you already have, like a photo, and turning it into a sticker with some adhesive. Selecting one of these machines is about understanding the size of the media you want to turn into stickers, and determining the type of adhesive you want to use. But if your project is more complicated and involved than taking family photos and turning them into stickers, you’ll need an instrument that’s sophisticated enough to rise to the challenge. Outside of cardstock, paper, and foil, one of the most common mediums for stickers is vinyl. But how many printers can help you cut vinyl? Choosing a sticker machine for more complicated design tasks involves slightly different criteria than choosing a simple sticker machine. The way you intend to use the sticker maker machine is ultimately what matters. Stickers don’t last forever. Based on how they’re printed, the ink used, and the paper involved, you’ll end up with drastic differences in the longevity of your prints. Much of their duration comes down to the type of print media you us for your stickers. Paper labels are simple and cheap. They’re ideal for slapping in name tags, record sleeves, and other ideas. They’re also widely available in pre-cut labels. Vinyl stickers are for production labels, bumper stickers, and other stickers that need to last. They’re often waterproofed with laminate, helping them fight off the elements when used outdoors. Printing on a variety of surfaces isn’t that hard, whether it’s vinyl or cardstock. A simple inkjet printer with a 1200 DPI resolution will be more than enough for virtually all types of sticker printing. But if you require tonal variation and dynamic color ranges, you’ll need to find a machine that can provide 6 or more cartridges. Will the stuff you’re trying to turn into stickers fit inside the machine? Different sticker makers have various limits on the thickness and proportions of the sticker sheets they print. The big choice here is in deciding between an integrated machine vs. selecting a separate printer and cutter. It’s a decision that heavily involves volume. Higher volumes should be done by single devices for the sake of efficiency and reproducibility. It’s okay to break out an X-ACTO Knife and a self-healing pad to cut out a dozen stickers. But if you’re doing more than a handful, you’re going to want a machine to help you along. For judging those machines, you’ll be interested in the pressure applied by the cutting implement, and the cutting speed. But volume isn’t the only consideration. Integrated sticker maker machines, containing large feature sets, are far better at saving space. Compared to having two or three separate machines, they’re enormously friendly for small spaces. 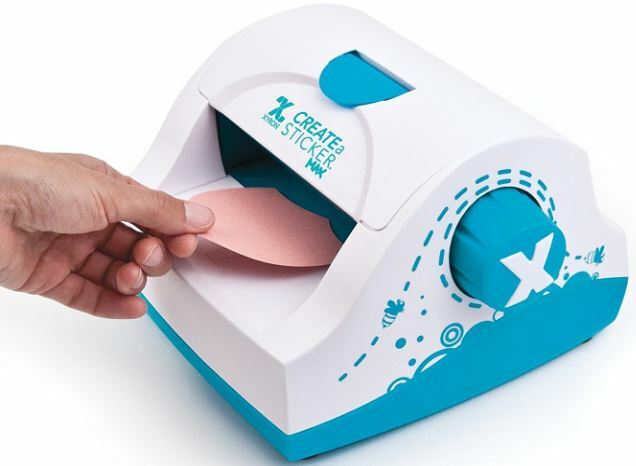 The Cricut Explore Air 2 is about as advanced as a sticker making machine can be. And it’s certainly as advanced as any non-industrial operation would ever really need. The first half of this unique machine is composed of a DIY cutting apparatus, but that’s only the beginning. The Explore Air 2 is great for making custom vinyl stickers, creating personalized home décor, drafting greeting cards, working on apparel, and virtually anything else you can imagine. Using the included Design Space software, you can design your next set of stickers anywhere. Design Space allows you to design from absolutely anywhere you can load the app. From a distance, the Cricut Explore Air 2 looks a little bulky. It sits at 24 x 9.5 x 9.5-inches, weighing 14 pounds. The bright mint color might not be your thing, but you’re certain to appreciate what’s on the inside. The included drawing instrument is a German carbide blade, which operates with considerable precision. It has no problem drawing out snowflakes and similarly intricate designs. And the Smart Set Dial helps the machine cut at the appropriate depth and pressure for the type of material that you’re using. Whether you’re cutting vinyl or you’re slicing into thin paper, the blade can be adjusted to precisely accommodate your design decisions. Moreover, you can load your own designs from Photoshop or Illustrator and not have to deal with the Cricut software entirely. You just need to know enough about what you’re doing to be able to vector an image. From there, you can upload content of your own. If you’re not a design expert, you can select from Cricut’s premade designs. 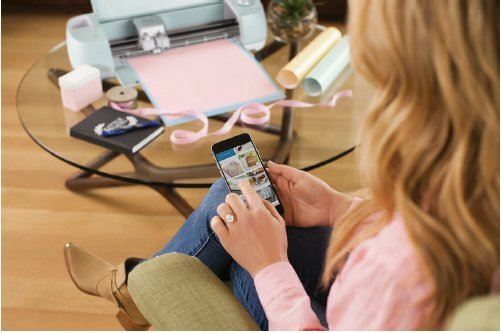 The Cricut Explore Air 2 supports over 100 different materials for cutting, including iron-on vinyl, cardstock, faux leather, specialty paper, poster board, adhesive foils, and so forth. It includes a Fast Mode, which nearly doubles its speed of operation. You can often use the Fast Mode for materials that are modestly thick, like cardstock, but not so thick as to cause too much resistance against the blade. 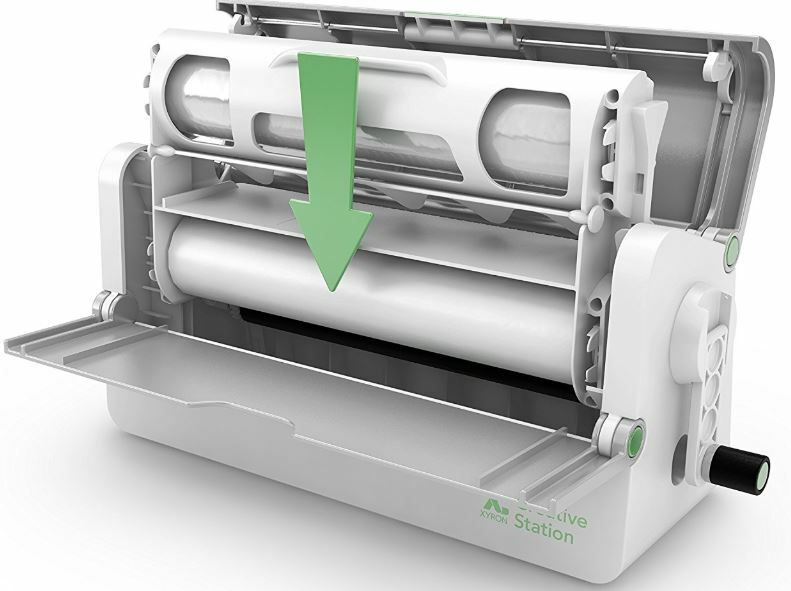 As a Scoring Stylus, this machine folds your cards, envelopes, 3D paper crafts, and so forth. The Cricut Pens feature allows you to make cards that appear handwritten, choosing from 370 fonts which are preloaded, or adding your own font. 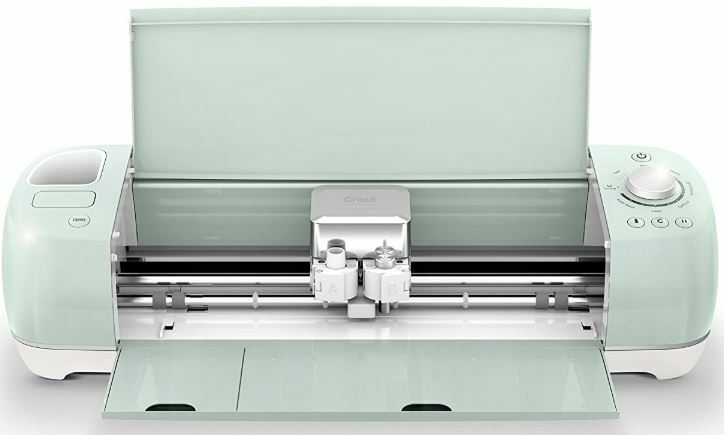 The Cricut will start writing for you, with an elegant, consistent, yet personal design. And cutting, writing, cutting, scoring in one-step is possible thanks to a double tool-holder feature. The included Bluetooth allows for wireless design, and the convenience to connect your Bluetooth devices to the sticker maker. The Cricut image library supports roughly 60,000 stock images. Unfortunately, their Design Space software reflects a minimal investment from the company. It gobbles through RAM limits and lacks an auto save feature. If you’re a design professional, you’ll want to stick to more robust software like Photoshop. But considering the software is basically an added feature to a great product, it’s more like a cool bonus for people who aren’t design pros. 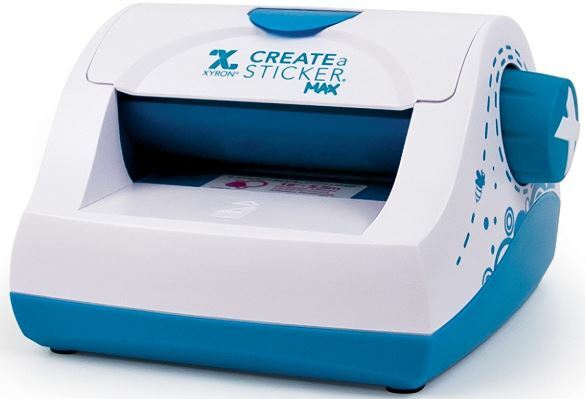 The Xyron XRN500EN is rather simple 5-inch sticker creator. It’s great for scrapbooking, making personalized photo cards, labels, creating tags for your stuff, and so on. It works by applying a firm adhesive to the edges of flat items, provided they fit inside the 5-inch maw of the device. For paper, photos, ribbons, and basically anything else that’s flat, the XRN500EN makes creating stickers easy. And a hallmark of Xryon devices is that you don’t need batteries, electricity, or heat to make your stickers. And your creations are permanent or removable stickers, and acid-free. This machine measures at a modest 8 x 8.5 x 5.5-inches. The entire machine weighs only 2.5 pounds. This 5” version is the largest in the XRN series, and overall the best buy because of its more versatile ability to handle print media. But if you’re only working with 1.5” or 2.5” media, you might want to consider one of the smaller versions of the XRN. Using the Xyron XRN500 is easy. 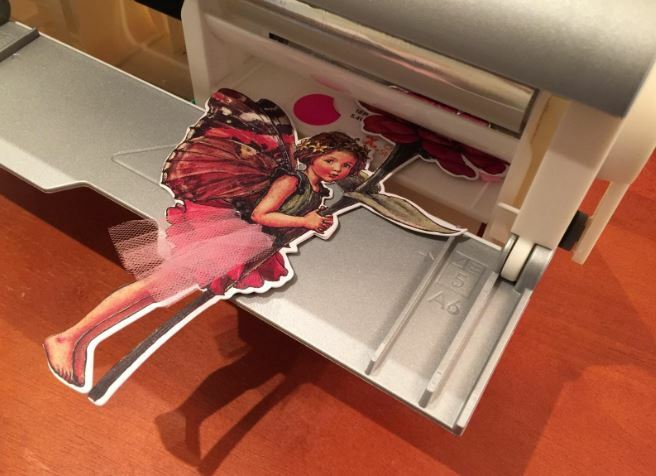 Stick your photo into the machine, like you were feeding paper into a printer. Push until you feel a little resistance, and then you use the knob handle on the side of the machine. Turning the knob cause your photo to pop out the back of the Xyron XRN500EN with an adhesive applied to its edges, ready to be stuck where you wish. You can place your creation against a sticker backing paper to protect and transport it. The adhesive can be immediately placed, unlike waiting for some types of glue. Replacing the glue cartridge will be necessary eventually. The adhesive rolls are 18-feet long, and 5-inches wide. Luckily, making the swap is easy. You just pop open the top of the XRN500, and place in a new cartridge. Xryon offers them in either permanent or repositionable adhesive. The repositionable adhesive allows you to move the sticker once or twice to get placement perfect, but doesn’t hold quite-as-strongly as the permanent adhesive. You should also note, Xyron offers a 1-year warranty on this machine, though it’s hard to imagine how it might break. The Xyron 624632 is a 9-inch sticker maker machine, built with a very similar design to its cousin the XRN500EN. 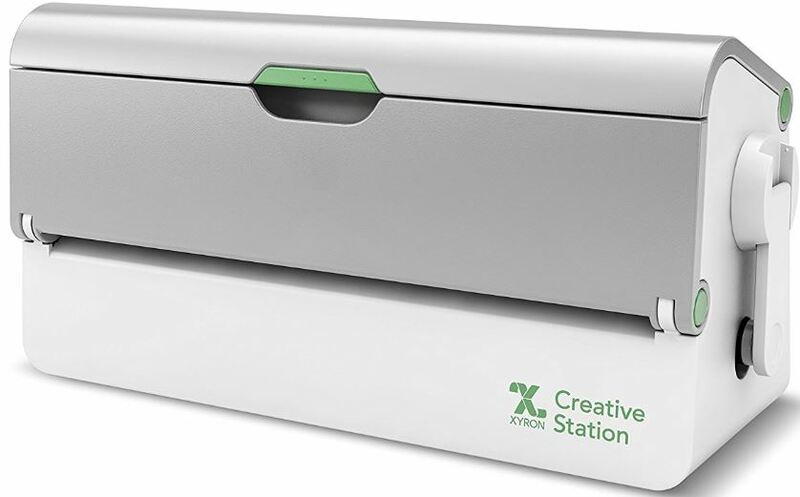 This Xyron sticker maker is intended to reduce the amount of desk space it takes up with a highly compact design. It’s 9” capacity allows more flexibility in media production while wasting less of your valuable materials. And like the XRN500, the 624632 doesn’t need heat, electricity, batteries for operation. The 624632 uses a tall and thin 13.8 x 6 x 7-inch build. The total machine weighs 4.8 pounds, light enough to carry from one location to the next. Its high pressure roller even supports cold lamination without peeling or lifting your documents. Like with the XRN500, an adhesive is applied edge-to-edge on your media, for corner to corner coverage on your stickers. You don’t have to deal with heat, you don’t have to we worried about fumes, and you don’t have to clean up a mess. The Xyron 624632 supports two cartridge sizes within the single machine, accepting either 9-inch of 5-inch adhesive laminate, magnet laminate, or adhesive cartridges. It includes a 25-foot, 9” adhesive cartridge to help you get things started. 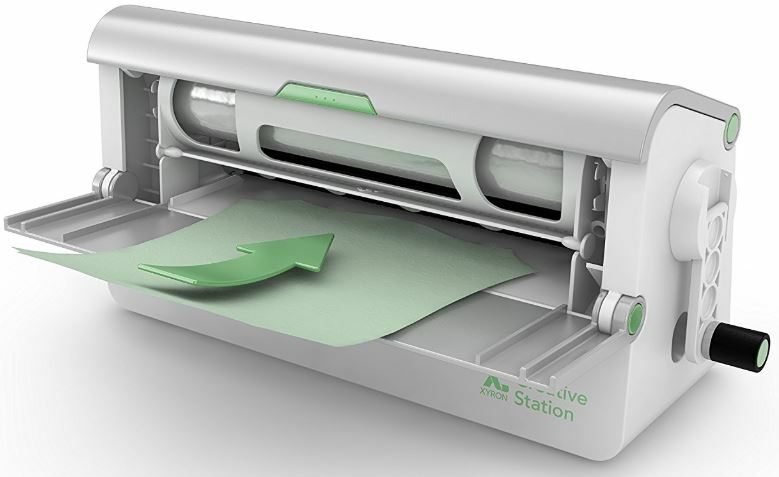 All in all, that makes this machine a sticker maker, magnet maker, and laminator packed into one device. The crank handle folds in for storage, which is great. But the casing and crank handle feel somewhat flimsy. You need to put one hand on the top of the Xyron 624632 to ensure its steady while you use the crank. This means you don’t have a hand to steady the feed, which can break alignment. Refilling the cartridges uses a simple drop-in design for rapid and accurate replacement. Acid-free and non-toxic design of the laminate and adhesive process makes it safe for you and the environment. Using the two cartridges lets you save material. Take note, this machine comes with the permanent variety of adhesive. If you need less permanent stickers, you’ll need to grab a separate cartridge. There’s no better word to describe the Cricut Explore Air 2 better than fancy. It has dynamic cutting options, a huge database of default sticker content, and software options for novices and experts alike. The German carbide blade offers precision for your sticker cuts, from thick leather to adhesive foils. This is the kind of machine you’d find in a professional print shop. If you’re printing smaller 5” stickers, then the Xyron XRN500EN is a great choice. It’s highly economical, and it’s got an easy to use design, both for creating stickers and for swapping the cartridges. While it doesn’t have the expansive capabilities of the other devices on this list, it gets the job done for smaller objects, whether ribbons or pictures. The Xyron 624632 is somewhere between the basic XRN500 and the highly advanced Cricut Explore Air 2. It provides cold lamination, the possibility of magnetic laminate, and so much more. It uses the same easily swappable adhesive cartridges as the Xyron XRN500EN, but has more versatility. Clearly it’s a great choice for anyone who wants to make stickers within a 9” frame, but its relatively small size and feature-rich design makes it easy to recommend to anyone.